When I was a young kid, my Mom would ask me to mow the lawn. The prospect of helping my mother was appealing, but the thought of entering the outdoor furnace was appalling. To help (literally) sweeten the deal, she’d promise to take me out for ice cream when the job was done. Suffice to say, the incentive was effective. Our lawn would be freshly trimmed, and I’d be sporting a fresh ice cream moustache all summer long. Wins all around! Little did either of us know, but our family had found lawn maintenance success through effective use of incentive marketing. 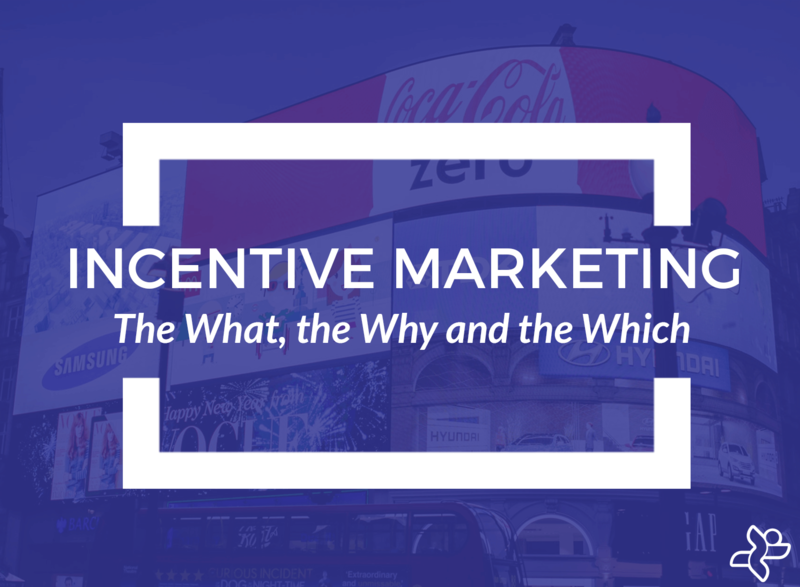 Essentially, incentive marketing involves businesses creating ways to incentivize customers to take desired actions (such as signing up an account, purchasing products, or mowing lawns). According to the Incentive Marketing Association, around $76.9 billion per year is spent on incentive marketing in the US alone. In a world of infinite products and choices, incentive marketing can be a powerful strategy for seizing viewers’ attention and converting them into customers. What makes a great incentive marketing strategy? Simple to understand and act on. Unnecessary complexity in any form (descriptive wording, required steps, process, etc) is more likely to create confusion than lead to your desired action. As creative as it is to create a “14 step, 7 tier, 5-year long reward program”, start simple and then expand as you have proof your customers are seeing the value. Embedded. The most effective incentive marketing strategies are embedded into the company’s product. This means they’ll always be available to users, won’t disappear and be lost in users’ feeds, and won’t lose their effectiveness over time. Seamless integration is especially important for digital products and experiences. Can marketing incentive programs help you go viral? Simply put: yes, but it’s almost never that simple (and that’s ok). One awesome example of incentive marketing is the referral program. User refers X friends, and user gets Y in return. In the case of Dropbox, this means free storage in exchange for referrals, and has helped Dropbox achieve an astonishing 3900% growth. Founders and marketers dream of achieving growth like Dropbox’s, but very few will, and that’s still ok.
One of the key metrics to look at with referrals programs is the viral coefficient. The viral coefficient tells the story of how many additional users each new users brings to a business. For example, your viral coefficient would be 0.2 if for every 5 people that sign up for your product, an additional person signed up as a result of referrals. The dream is to achieve a viral coefficient over 1 (signing up one new user results in even more than one user signing up through referrals), but any factor above 0 will still very positively impact your business. A viral coefficient of 0.2 might not sound like much, but if you extrapolate that to a business gaining 1000 new customers per month, you’ll realize that that 0.2 coefficient is actually bringing them 200 additional customers each and every month! Incentive marketing strategies, such as referral programs, help businesses amplify every user that comes into their funnel. This accelerates revenue growth while reducing average customer acquisition cost. To make your incentive marketing campaigns as effective as possible, you must operate with a scientific mindset, and put in the time to test what works and what does not. Multivariate and A/B testing involves making product/incentive changes that are only seen by a portion of users. When only one cohort or segment of your customers can see version A of your product, and the other can only see version B, you can make arguments and derive decisions based on the data coming out of these two groups. You will derive meaningful KPI’s that support your assumptions and hypothesis. If you are planning on emailing everyone on your list, make sure you start by emailing only a portion so that you leave room for control groups and AB testing. Note that in order for these experiments to work, you have to have enough participants and run the test long enough for the results to be meaningful. Often an element of A/B testing, and essential for optimizing your incentive marketing campaigns, are control groups. Control groups are useful because they help account for environmental changes that are harder to track. Control groups help ensure you attribute the effects of an experiment to its actual cause, and enable you to determine the actual impact of your incentive marketing efforts. Give up on your idea only when it is objectively appropriate to do so, not because you are sick of trying. Avoid repeating work you’ve done before. If you’re running multiple incentive marketing campaigns, be sure to leverage what proved to be effective in your past efforts in your new efforts. Don’t keep your learnings in silos – share the knowledge across your organization for everyone’s benefit! Just like you learned during high school science, make sure you gather data to support that it was your new incentive marketing campaign that drove your business’s exponential growth in user base last month (and not the fact your intern mistakenly set the price of your product to zero). In the words of Michael Scott quoting Wayne Gretzky: “You miss 100% of the shots you never take”. Use the insight generated by failed experiments to inform your future successes. Most experiments will fail. This is the harsh truth. You learn from your failed experiments as well as your successful ones. Just because someone else hasn’t tried something doesn’t mean it doesn’t work. It could be that it’s a terrible idea, but it could also be that no one has been brave enough to try it. Use your curiosity as a great marketer to overcome your fear of being wrong or different. You need the guts to think about really bad ideas to have the opportunity to execute brilliant ones. You only stop learning when you stop trying. Be brave enough to have bad ideas, and be smart enough to use data to guide your path towards something brilliant. There is a phenomenon in which entrepreneurs think each experiment they are working on is THE ONE. The one that will bring them numbers and glory, and allow them to reach extreme velocity. Most experiments fail, however. And that’s ok.
A great goal should be attacked from multiple angles. Commit to and trust in the process. Always keep in mind that small successes compound over time. You’re more likely to gain the most benefit from multiple small wins than one big one. There are several options for building your incentive marketing campaigns. Everyday the world’s top companies use incentive marketing to amplify their growth, and reach new heights of success. Here are 5 awesome examples of incentive marketing done well. We hope the examples and tactics outlined in this post will help inform and inspire your own incentive marketing efforts. Good luck! Alacrity Canada is a venture builder that supports driven entrepreneurs. We help create thriving companies & connect them to our global network of expert investors & mentors. To explore more of our content, check out the Alacrity Blog, and Alacrity’s podcast on early-stage tech investment: Between 2 Term Sheets.